Or, a beginner’s guide to the political geography of the Sunshine State. If you live in South Florida, it’s easy to get a false impression of the state as a whole, because this area is so different from other parts of the state that, at least politically, it could be in another part of the country entirely. Let’s start with these two maps. The first shows the results of the 2008 presidential election (by county) and the second shows the results of the 2010 election for governor. It’s obvious at a glance that there is a lot of consistency between these two quite different elections. The Panhandle, or South Alabama. A Republican stronghold. They don’t call this the Redneck Riviera for nothing. Northern Florida, or South Georgia. This includes the Jacksonville metro area and is another Republican bastion. The Farm Belt. These are the largely agricultural counties in the inland parts of the state stretching from around Gainesville south to around Lake Okeechobee—also strongly Republican. The I-4 Corridor running from Tampa/St. Pete through Orlando to Daytona. This is a swing area which has recently been trending towards the Democrats, at least in the metropolitan counties. The Southwest Coast, or Midwest Snowbird Land. These are the Gulf coast counties south of Tampa. Demographically, they are overwhelmingly Anglo white, with only small numbers of blacks or Hispanics, and they reliably vote Republican. The Space Coast, from Brevard County (S of Daytona) down to Martin County (N of Palm Beach). Recently has been more up for grabs, but generally votes conservative. And finally, South Florida, the state’s most populous region including Miami-Dade, Broward, and Palm Beach counties. It—overall—tends to vote strongly Democratic. In many ways, Florida is like a microcosm of the country. As is apparent, there are more Republican regions than Democratic ones, but the latter have more people and more votes. The regions that are culturally more “Southern” vote Republican—if the voters are white, which most of them are. Even within these regions, the urban core tends to vote Democrat, but the further out into the suburbs and exurbs you go, the more Republican—and Tea Partyish—they become, a pattern familiar throughout the country. I have always attributed this largely to conservative whites’ fear of blacks and other non-Anglo minorities and to their unshakable belief that these minorities are getting undeserved benefits at taxpayers’ (i.e., their) expense. For the GOP, the real pay dirt is in the Tampa and Orlando regions, where almost half of all registered Republicans live. Check out this interesting article by the brilliant poll analyst Nate Silver. By the same token, the Democrats need to do at least as well in the I-4 corridor as they have done in the past two elections. Of course, it’s not exactly coincidental that the Republican national convention is in Tampa. To win Florida, the minority vote—particularly the Hispanics—has become crucial. For a long time, the Florida Hispanic vote was thought to be synonymous with the Cuban vote and therefore mostly Republican, but neither assumption holds true any more. Take a look at this graphic that appeared in a post from the Immigration Policy Center published by Daily Kos. 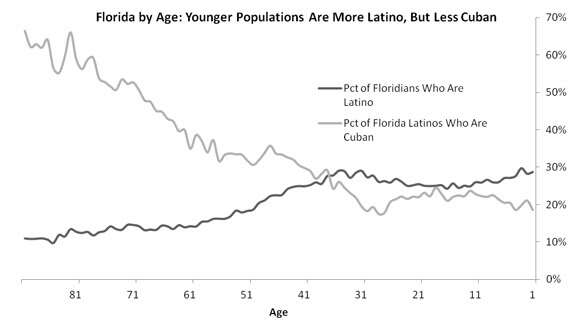 As the piece points out, Cubans are now a minority among Florida Hispanics except among those over 70—only 29 percent of the Florida Latino population is now Cuban in origin. 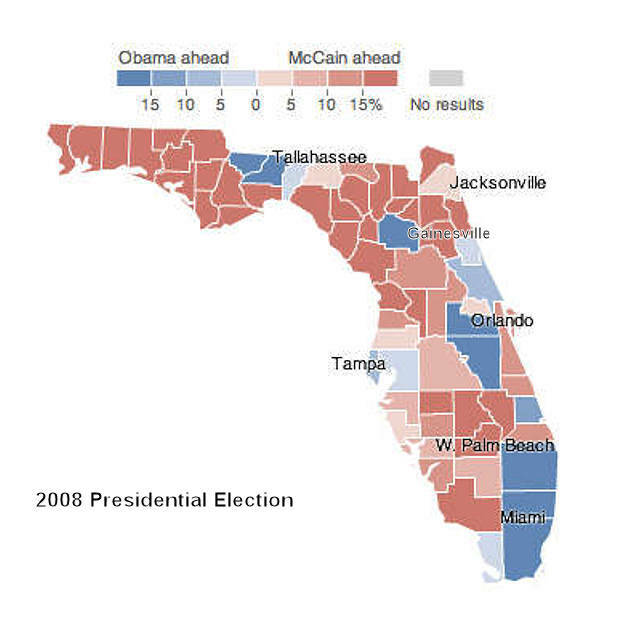 And Hispanics are an important factor in other parts of the state—not just in South Florida. The Tampa Bay Times recently published a story on the changing demographics of Osceola County (just south of Orlando), where almost half of the population is now Hispanic and mostly of Puerto Rican origin. The hostility of the national Republican party toward Latino immigrants has become a real problem for the party in Florida, in part because the Cubans who are now the Latino face of the Florida GOP received a much more welcoming embrace from the US government than did immigrants from elsewhere in the hemisphere. Just ask any Haitian or Mexican. That’s why politicos like Marco Rubio have tried to come up with their own “Dream Act Lite”, but it’s hard to sell that when fellow Republicans like Arizona Governor Jan Brewer are pulling a George Wallace-style defiance of President Obama’s measure to allow children of illegal immigrants to remain in the US legally under certain conditions. 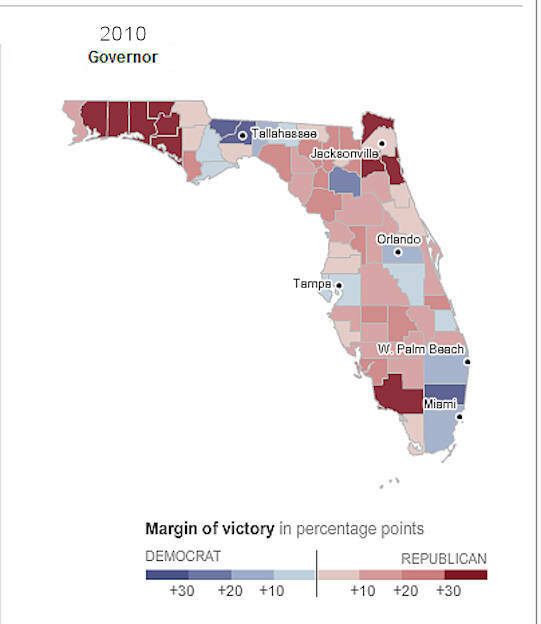 In Florida, as in most of the country, black voters go overwhelmingly for the Democrats. This explains why Rick Scott and his minions in the state legislature as well as other Republican officials in other states have worked so strenuously to enact measures that will almost certainly suppress black votes. We shouldn’t forget that in the infamous 2000 election, more than 22,000 votes were reportedly nullified in Republican-dominated Duval County (Jacksonville), most of which were from a few predominately African-American precincts that went heavily for Al Gore. (In case you were on Mars or less than two years old at the time, George W. Bush won Florida—and therefore the election—by 537 votes). If you’re skeptical about whether the vote suppression is really GOP policy, read the article here where former Florida state Republican chairman (now under indictment, but not for that) spills the beans. It would be ironic, wouldn’t it, if the votes of blacks and Hispanics this year wound up saving the country from the disastrous consequences of the radical Republican agenda and white people from their own stupidity. « Hurricane’s Coming, Do You Have Insurance?